Thank goodness for March 31 to have arrived and gone! Now my work schedule can get back to normal again. The last two months have been a frenzy at work to complete our new web site and get it up and running properly. After working a lot of overtime lately it was nice to actually come home on time today! The work is not near over as Phase 2 starts immediately with enhancements and further functionality, however at least the pace has slowed down. Now I can focus more on my own work again. And as a reward I get Friday off without taking a vacation day – woot! Long weekend! I’m also starting a new photography project this weekend. Last year I participated in Project 52 on Flickr and had considered doing it again, but wanted to switch things up a bit this year. Lucky for me I found just the thing – a Flickr Photography Scavenger Hunt! The new list is available this weekend, perfect timing for me to start up with it. It looks like a fun group and will get me out and about and looking for the items on the list to photograph, hopefully with an interesting aspect and not just a snapshot of each item. It’s an open group for anyone in the world, so if anyone is interested in taking the challenge with me join here! 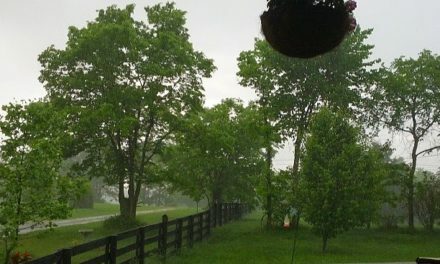 Love having a covered porch during rain storms! We are sure glad that things are slowing down for you. We will get mom to check out the Flickr Project. She is always taking pictures.